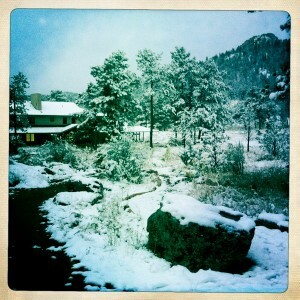 I’m just back from teaching a wonderful meditation and writing retreat in the Colorado Rockies this past weekend. The weather conspired to create the ideal setting for turning inward. Snow began to fall as our retreat began and continued to blanket the ground, socking us in completely. There was nowhere to turn but in. On the final day, the sun came out and melted away whatever might have kept us from leaving, opening the door to return whence we came. Thank you, world. Two things seem to happen automatically when you have the precious opportunity to retreat from daily concerns and reconnect with yourself, the self who exists beyond your responsibilities, children, partners, friends, and who the TV tells you you’re supposed to be. The first is both interesting and somewhat disconcerting: emotions rise. I don’t know why this is. I just know that as a practitioner and teacher, I’ve seen it time and time again. Meditators soften to the point of tears. I’ve come to the conclusion that it’s not so much a psychological dynamic—as in, all the emotions you’ve been holding back or consolidating into neurotic forms are suddenly shaken loose and begin to flow, although I’m sure there is something to that—as it is a simple return to who you really are—tender, vulnerable beings who feel things deeply, see into phenomena sharply, and are nothing more—or less—than a great responding machine. All day, all night, we respond, respond, respond to our environment, out thoughts, our world. This is because, in truth, we are deeply unshielded. We spend much of our time constructing shields—out of ideas, money, lifestyle, you name it. When we sit to practice, all of this falls away. What is left is a giant beating heart that is so beautiful and raw. While it can feel sad, it is also quite joyful and real. Immediately following this sacred-but-oh-so-ordinary opening comes a secondary response and I believe it also comes to those who attempt creative work, which requires and is indeed mandated by the same kind of opening that occurs in meditation. It is called shame. I don’t know why, but for most of us, myself included by all means, opening and feeling my own heart simultaneously gives rise to shame. For those of you who write, this is most often expressed by some form of the question, “who cares what I have to say?” Or, “this has all been said before,” “what right do I have to express myself/have an opinion/hold my ideas, conclusions, or insights up as meaningful?” These questions are pure poison and they are by no means limited to artists. We all feel the need to justify our very right to existence, as if it was questionable. Most often, we try to come up with some reason why we deserve to or have a right to express ourselves, but any answer we can come up, no matter how pithy and insightful, is a concession to the question of self-worth, which is something that need not ever be questioned in the first place. You exist. You are you. There is only one and there will never be another. The fact of your singularity is what provides a lifetime warranty protecting your self-expression. However, the shame is totally workable. It is simply a mistaken manifestation of tenderness. If you poke the tiniest bit underneath shame, you find sadness—a deep and tender longing to be seen, heard, known, and, yes, of course, loved. You deserve this. There is no question. Unlike shame which is a huge black dead-end, sadness is a great and sacred opening. It is entirely workable. Shame shuts you down. Everything seems meaningless. Sadness opens you up. Everything seems meaningful. It’s that simple. So when such self-doubt arises, return to the joyful sadness that arises through meditation practice and/or creative work in general—anything that requires an opening to the inner environment and recognizing it as precious and unique. You can be sure that when you do, emotions will surface. If you fight them, they become shame. If you allow them, a vast opening appears. Such joyful sadness will always arise. It is your protection. It is your strength. It shows you again and again what you are made of, that your essential nature is open, responsive, and constructed of one thing only: heart. This heart is proof of your indestructible goodness. Such goodness is your birthright—and mine, everyone’s—and when you connect with it, acknowledge it, embrace it, live from it, you find all the confidence you will ever need. When you rest in your own goodness, even shame itself appears as an interesting momentary adornment. Ultimately, meditation is the practice of opening your heart in exactly this way and, rather than freaking out and trying to close back up, remaining open and stabilizing yourself in the open state. Such opening and stabilization mean everything. They are the antidote to shame. In the video below, I say basically what I just wrote in this post, but some people prefer video. I make these kinds of videos as part of The Open Heart Project. I also send along meditation instruction videos (10 minutes long) twice a week. Please sign up to receive these videos and join the growing, vibrant community of brand new and seasoned practitioners, artists, and basically awesome human beings who participate in The Open Heart Project. I know that YOU know exactly what I mean by this joyful sadness. Glad this message was timely and please don’t ever forget what a singular, smart, and soulful Meghan you are. But if you do, I will be most delighted to remind you. Thank you. It is so helpful. So glad to hear it, Barbara. This is a piece of what I’m working on at the moment: the aftermath of softening and opening, if you will. A part of me has been thinking, “how cool that all that work leads to this” while at the same time having a hard time managing that level of tenderness in a world that’s just not geared toward that. There’s a piece of that helps with that in here. Thank you. Yes, not easy to reconcile it all. For sure. Your calm and kind presence in delivering this message really spoke deeply to my shame-broken heart. Thank you for being an instrument of peace and healing. Very nice to know you, Sandee. Very useful and welcome today, your distinction between sadness and shame. Thank you. So glad it was useful, Jeffrey.